Tigers of the World, 2nd Ed. PART I: WHAT IS A TIGER? 5. Will the Tiger Survive in India? 15. Why keep tigers in zoos? 23. This Heaven and this Earth: Will India Keep its Promise to Panthera tigris? 27. Tigers and People in the Malay World: Four Centuries of Confrontation and Co-existence in Comparative Asian Perspective. 31. The Claws of a Dilemma: Can Big Business Contribute to Tiger Conservation in Indonesia? 40. Roads to Recovery or Catastrophic Loss: How Will the Next Decade End for Wild Tigers? Tigers of the World, Second Edition explores tiger biology, ecology, conservation, management, and the science and technology that make this possible. In 1988, when the first edition was published, tiger conservation was still in its infancy, and two decades later there has been a revolution not only in what is known, but how information about tigers is obtained and disseminated. In the fast changing world of conservation, there is a great need to summarize the vast and current state-of-the-art, to put this into historical perspective, and to speculate in what yet remains to be done. 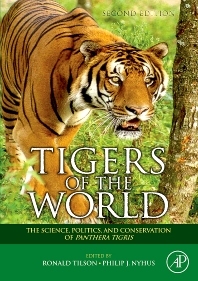 Tigers of the World, Second Edition fulfills this need by bringing together in a unique way the world’s leading tiger experts into one volume. Despite the challenges ahead, there are bright spots in this story and lessons aplenty not only for tiger specialists but large carnivore specialists, conservation biologists, wildlife managers, natural resource policymakers, and most importantly the caring public. This book is intended for a wide readership, from specialists in tiger conservation and large carnivore conservation, to conservation biologists, ecologists, and wildlife managers more generally interested in wildlife issues. This book will appeal to the global conservation community as well as the zoo community. As a zookeeper for Amur tigers, the information in this book is very helpful and informative for husbandry, and for educating visitors. Each chapter provides a good assortment of information. I would’ve liked to have seen a little more detail on physiology of tigers and how this can be applied to husbandry practices. It does provide information pertinent to husbandry as well as in the wild, which is hard to find! The book is helpful in discussing topics such as conservation, taxonomy debates, and life history.